The primary mortar of the Afghan Army is the M224 60-mm Mortar. 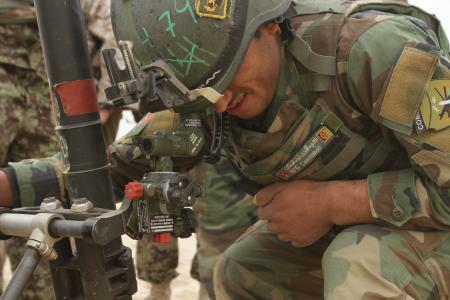 The Afghan National Army (ANA) is fielding the M224 as the primary fire support for platoons and companies. The M224 complements the fielding of the D-30 howitzer and 82mm mortar. The M224 Mortar provides indirect fire support to Afghan ANA ground units. Ammunition for the 60mm Mortar. The mortar fires the 60-mm round. It is a high-explosive, multi-option fuze. The rate of fire is 18 to 30 rounds for 1 to 4 minutes; sustained rate of fire is 8 to 20 rounds per minute. It can fire high-explosive, white phosphorous/smoke, and illumination rounds. Characteristics and Specifications of M224. The mortar requires a crew of about 3 members. It is a high-angle mortar used for indirect close-in support of ground units. The mortar can be fed by a manual spring-loaded firing system or gravity-fired. The weight is about 48 lbs. Where Does Afghanistan Get the M224s? Currently the mortars are provided by the U.S. as part of its military aid package. One extremely large contract was awarded to the Watervliet Arsenal in early 2013. 2 The contract, as part of the U.S. State Department's Foreign Military Sales (FMS) program, provides for the delivery of 900 mortar systems. Jackson, Joseph A. Howitzers on High Ground: Considerations for Artillery Employment in Southwest Asia, SAMS, Fort Leavenworth, KS: AY 2009. M224 Mortar. U.S. Army Fact Files. September 12, 2014. "ANA one step closer to self-reliance". DVIDS. Members of 3rd Cav Regiment provide Train-the-Trainer (T3) classes to mortarmen of the 203rd ANA Corps at FOB Thunder, Gardez, Afghanistan. March 9, 2014. "Afghan National Army soldiers familiarize themselves with mortars, demolition". DVIDS. ANA soldier learn about the M224 60 mm mortar at a 4-week basic mortarnman's course at Camp Shorabak, Afghanistan that is part of the Regional Corps Battle School (RCBS) of the 215th Corps. January 10, 2014. "Enabling the Afghan National Army". DVIDS. Advisors teach the ANA how to use the 60-mm mortar system. April 16, 2013. "Coalition hands over mortar training to ANA". DVIDS. 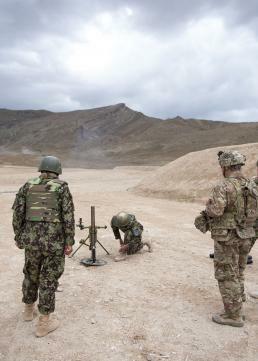 A train-the-trainer course puts the 60-mm mortar training capability into Afghan hands. April 12, 2013. "ANA commandos teach new soldiers mortar system". DVIDS. ANA trainers teach new ANA soldiers the M224 60mm mortar system at Camp Shurabak. March 20, 2013. "Mortar Malfunction Blamed for 7 Marine Deaths". USNI News. February 28, 2013. "Heavy weapons training hits the target". NATO. January 23, 2013. "Coming This Year to Afghanistan: Way More Artillery Strikes". Wired.com's Danger Room. November 1, 2012. "Bombs Away: Will Afghanistan's Artillerymen Learn How to Shoot Right?" Time.com. This article high-lights problems that the ANA have in getting accurate fires on target and how SFAATs are working to improve the ANA fires capability. October 28, 2012. "Afghan Army Seeks Better Equipment, But Lacks Basic Skills". NPR. July 29, 2011. "Lighter Mortar Systems Tested". dcmilitary.com. July 22, 2011. "US Army fields lightweight mortar system". Janes.com. January 13, 2012. "1-502nd trains ANA on mortars". Fort Campbell Courier. July 28, 2011. "Marines Test New Mortar System". DVIDS. 1. For more info on the Afghan Artillery Branch School see Afghan Army opens new artillery training center, NTM-A News, October 5, 2010 accessed here. 2. See more on the delivery of M224's to the ANA in Watervliete Arsenal to supply 60mm mortars to Afghan National Army, army-technology.com, February 26, 2013. All external sites open up in an new window. Please report any broken links to the webmaster at staff@afghanwarnews.info.